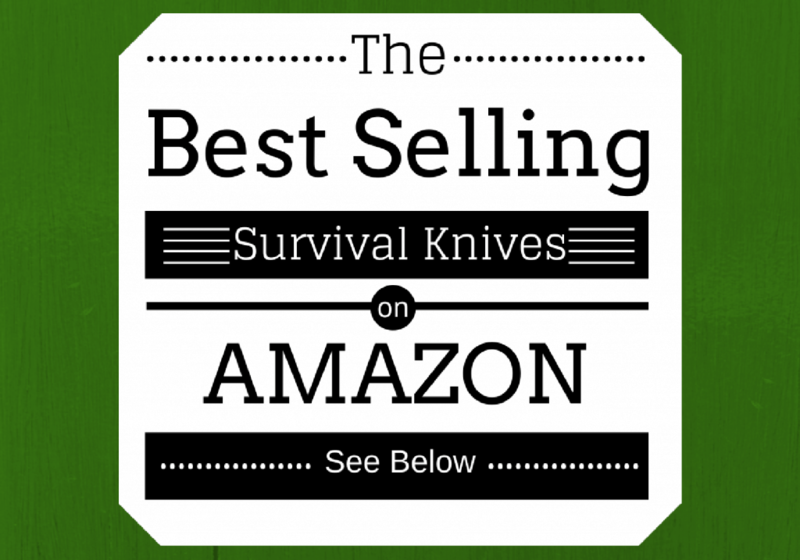 You are here: Home / Survival Knife / What’s the Best Knife for Camping Survival? 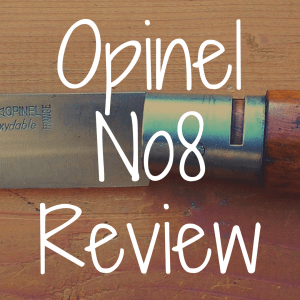 What’s the Best Knife for Camping Survival? When camping, there are two kinds of knives that come to mind. There’s the knife for the ordinary tasks of a camping trip: cooking, fishing, setting up a fly, and more. Then, there’s the knife for when everything that could go wrong does go wrong. The knife that keeps you alive. This article is about those knives that keep you alive in the wilderness. We will address qualities that are essential in a camping survival knife, then discuss in detail five of our favorite knives for camping survival. And, in order to better help you, we have compiled a list of notable and popular camping survival knives in our interactive table below. the capability of being secured via a sheath or in the pocket during a survival situation. Knives that are designed to keep you alive in the wild are very different from knives that are designed to keep you alive in a tactical or combat situation. With a combat knife, you are looking for something that is going to be lightweight, fast-opening, concealable, and able to puncture with ease. With a survival knife, those same factors may not work in your favor. First, a survival knife works double duty, substituting as a hatchet or machete. 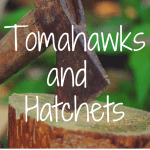 When used to split wood or break down brush, a heavy knife is better than a lightweight knife. Second, a survival knife is not often a folding knife (although I do discuss an exception to that rule in this article), because rather than having a fast-opening blade, a survival knife needs the extra strength of a full tang fixed blade. Having a fixed blade will help keep the knife from falling apart while breaking up kindling for a fire. With a survival knife, having a long, bulky blade means that the knife is more versatile as a chopping implement or spear tip. 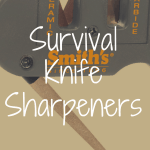 A good survival knife should also have a durable blade that is still easy to sharpen. When it comes to steel alloys, there is a sort of sweet spot between having a blade that will maintain its edge and a blade that can be quickly sharpened in the wild. Having a blade that is made of such a hard steel alloy that it cannot be honed quickly means that it will take an extraordinarily long time to sharpen it in the field. Having a blade that is made of a soft steel alloy means that it will need to be repeatedly sharpened in the field. The kukri is a survival knife with an incredible historical legacy. First developed in Nepal, it was taken up as a utility weapon by the Royal Gurkha Rifles of Great Britain and the Assam Rifles of India. The utility of the kukri goes beyond being a weapon, however. The Gurkha Kukri Plus is a phenomenally sturdy example of the kukri, with its thick 5/16” blade that curves along for 12 inches before coming to a sharp point at the tip. The kukri is designed to work much like both a machete and a hatchet, and the Cold Steel Gurkha Kukri Plus does both very well. Because of its thick blade, the Gurkha Kukri Plus is also well suited to batoning. Its blade is made of O–1 steel, which is very hard, although may be as difficult to sharpen as the hardened steel alloys of tactical knives. The Gurkha Kukri Plus has a Kraton handle that allows for incredibly strong grip on this knife. One possible flaw may be the price tag, as the Cold Steel Gurkha Kukri Plus retails for approximately $160.00 at the time of this writing. For some, a smaller, less conspicuous survival knife may be desirable than a machete-size implement of destruction. For those – and for those looking for a cost-conscious option – the Ontario Knife Company RAT–7 (or even the smaller RAT–5) is a better fit than the other knives on the list. Ontario Knife Company made its name developing tactical and survival knives for the US Armed Forces, including one of the standard issue bayonets used by the US Army and a survival knife issued in the US Air Force. 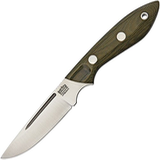 The RAT–7 is part of its line of fixed bushcraft knives, with a seven-inch 1095 steel alloy blade that is 0.19 inches thick (which may not be ideal for hammering the blade into wood). The RAT–7 has a chunky micarta (composite fabric and plastic) handle that I find perfect for grip. The blade is designed with a choil that protects the forefinger when doing delicate work, such as shaving branches for fire starters. It also has the necessary heft to be used for chopping, along with a full tang that makes it possible to use the knife for batoning firewood or hammering with the pommel. Where the RAT–7 is weakest is its sheath. 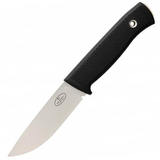 The RAT–7 has a nylon and plastic sheath that does not secure the blade within, instead relying on two snaps to secure the knife by the handle. Thus, if you were carrying this knife on your pack or it got caught while you were scrambling, the knife is not as secure as it would be in a better built Kydex or leather sheath. If the problems with the sheath are a deal breaker, a bit of Google work should find you alternatives to the stock sheath. Retailing for roughly $80.00, the RAT–7 is one of the most cost-effective survival knives for sale. The Fallkniven A1 Survival Knife is an ideal survival knife for those in wet or humid conditions, due to its stainless steel VG10 core manufacture. This is not a knife that will rust easily. Like all of the fixed blades recommended here, the Fallkniven is a full-tang knife, with the tang extending slightly beyond the rubberized Kraton handle for use in hammering or striking. Additionally, while this will be one of the harder blades to sharpen, the VG10 blade will retain its edge very well. Whereas the RAT–7 has an extremely utilitarian and simple clip point design, the Fallkniven A1 has an elegant, drop point reminiscent of the classic Bowie knife. The knife blade is 6.3 inches long, and the knife overall weighs just under a pound at 12 ounces. The knife blade is 0.24 inches wide, making it suitable for batoning wood. The A1 also has a well-designed Kydex sheath (although there is also a leather option available) with a drainage hole (again, well-suited for wet or humid environments). If the Fallkniven A1 has a weakness, it is that, at $185.00 retail, it is an expensive knife. However, with that cost comes an exceptionally well-designed, sturdy survival knife. 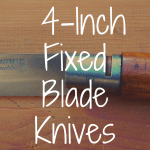 Thus far, all of the knives on this list have been fixed blade knives. However, with restrictive laws in multiple jurisdictions, fixed blade knives may not always be possible, let alone desired. Fox – not a well-known manufacturer in the US, but one that earned its stripes as a supplier to other NATO nations – based the design of the Aruru on the Malaysian parang bushcraft knife. With a blade length of 4.33 inches and width of 0.19 inches, the Fox Aruru is substantially thicker than most folding knives (and many fixed blade knives). For this reason, this is one of the few folding knives that I believe could stand up to bushcraft-grade use, namely chopping and batoning. The unique shape of the Aruru’s G10 handle allows a user to compensate for its relative lack of heft (compared to the kukri and Fallkniven described above) while chopping, and the rounded blade shape makes this an excellent knife for field-cleaning game. The blade is made of extremely hard (HRC 59–60) N690Co steel alloy, which means it will take a serious beating for it to lose its sharpness. 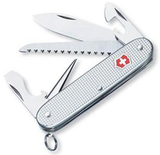 The Aruru comes with a nylon sheath, which may not be necessary given it is a folding knife, but is a plus. The Aruru weighs only 10 ounces, making it lighter than most camping survival knives, a potential flaw. It also retails for approximately $180.00, so sticker shock may also be an issue. It seems only fitting to wrap up with a Ka-Bar, given the brand’s association with military survival knives and the rugged work of the US Marine Corps. The Ka-Bar BK–22 is an outstanding and reasonably priced camping survival knife. The BK–22 has a 5.25-inch long blade that is also 0.25 inches thick, meaning that it is ideally designed for breaking up firewood. The blade is made of 1095 Cro-Van steel alloy, meaning that it will hold its edge well, but still be able to be field sharpened. The BK–22 has a full tang blade and a glass-reinforced nylon handle, which can be swapped out for a wooden handle (available separately). 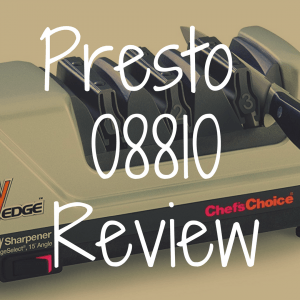 Because of its blade length, the BK–22 may not be ideal for chopping (other similar blades solve this with improved ergonomics, something the BK–22 does not do), and this is not a rust-resistant blade material. 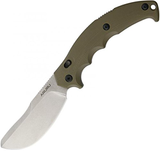 Additionally, weighing in at 14 ounces, the BK–22 is a bit too heavy for a five-inch blade. Like the RAT–7, this knife retails for approximately $80.00, though, so it is a low-cost knife that can be put through heavy abuse.